« A Fabulous Brunch by my Friend, Rachel! 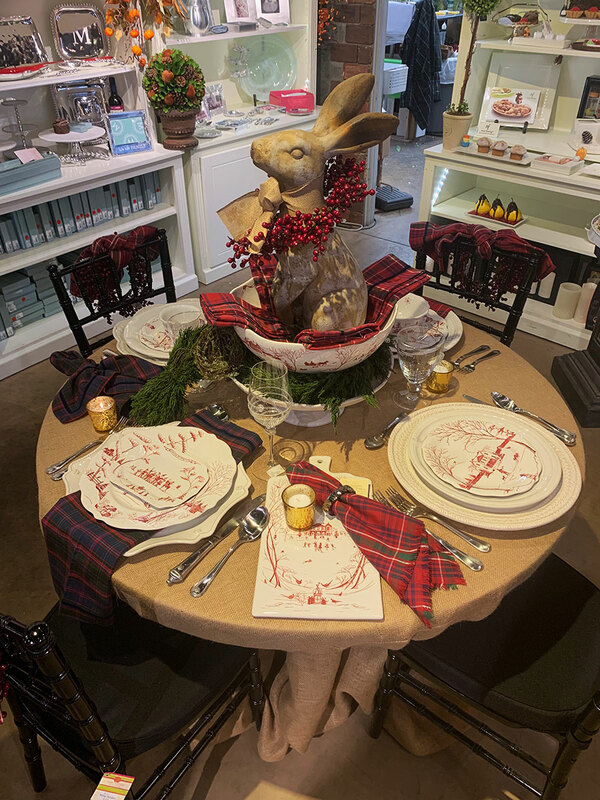 Juliska Holiday Table at Mary Tuttle’s With Bunnies… YES, Bunnies! I truly enjoy working with Mary Tuttle’s, a beautiful home décor and fresh flower retailer in Chesterfield, Missouri. I’ve worked for them for over seven years creating their marketing campaigns and developing their marketing strategies. Walking into their store is like walking into a magazine. Every nook is filled with inspiration on interior design and entertaining. Each year, they are part of a tabletop event for a local St. Louis publication. 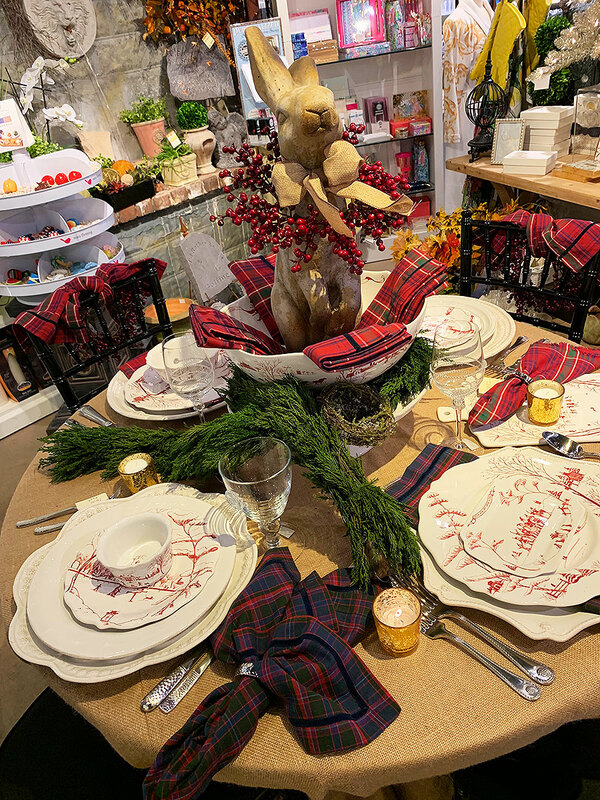 This year, they chose to create a holiday table with the centerpiece that didn’t include a Santa, Christmas Wreath, or Christmas Tree. 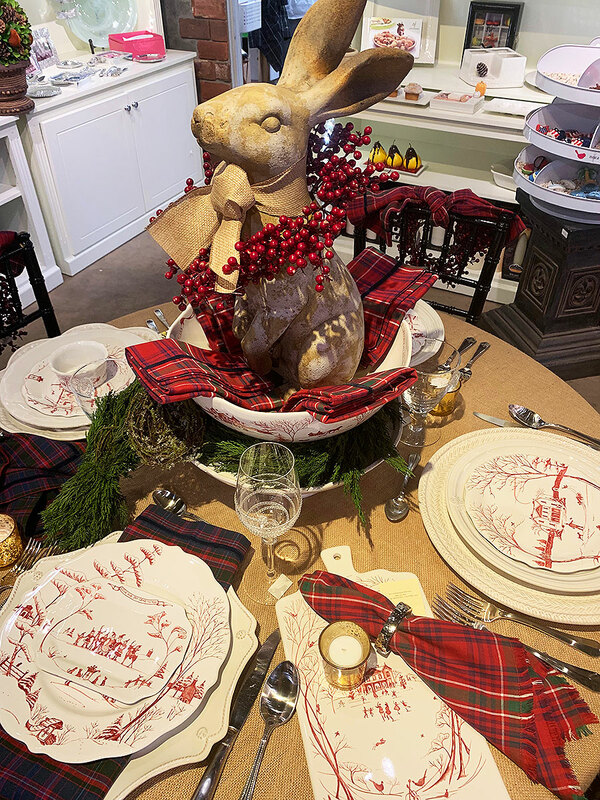 This year, their centerpiece was a bunny. 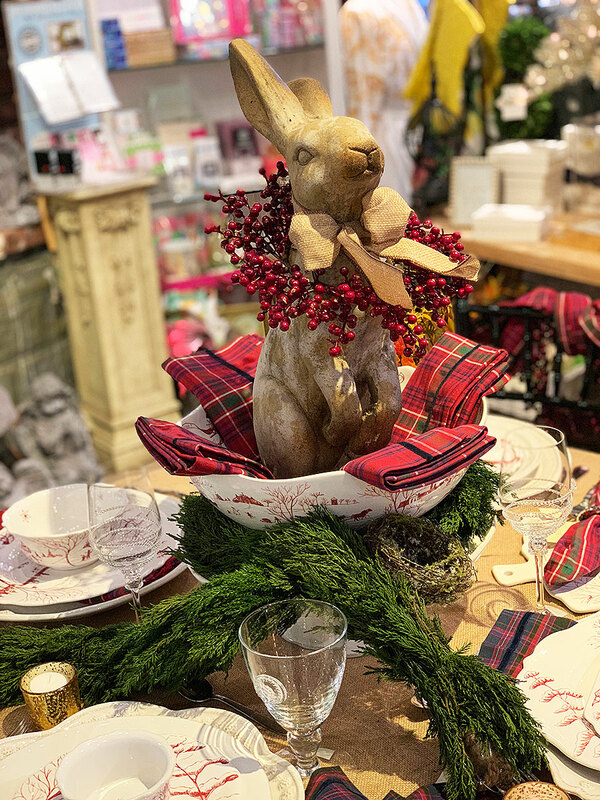 A cute stone bunny that was tied with a burlap bow, wearing a necklace of cranberries, nestled inside a tartan napkin filled punch bowl… and I’m not done yet…sitting on top of a cake plate covered in pine clippings. Yes, that was the centerpiece and it was DIVINE!!! 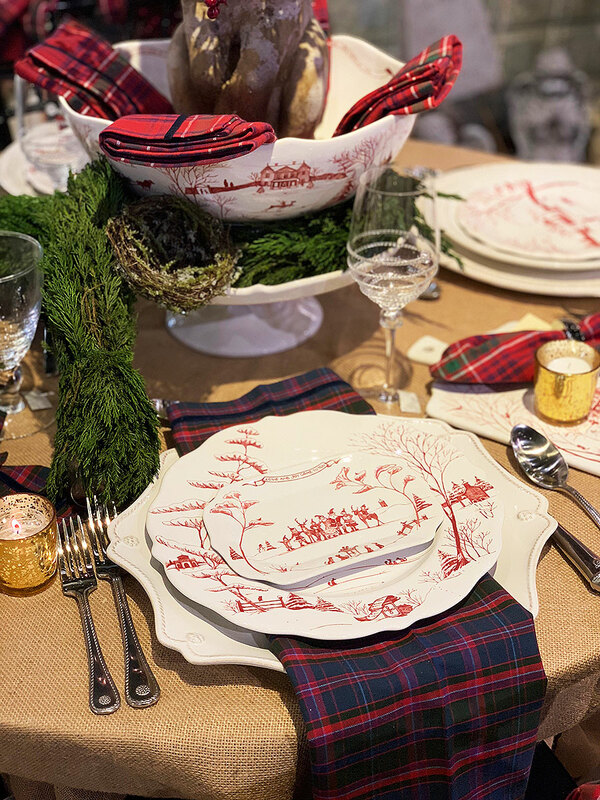 The tablecloth was a simple burlap and the place settings were all different, with primarily holiday themed Juliska plates in Country Estate Winter Frolic. 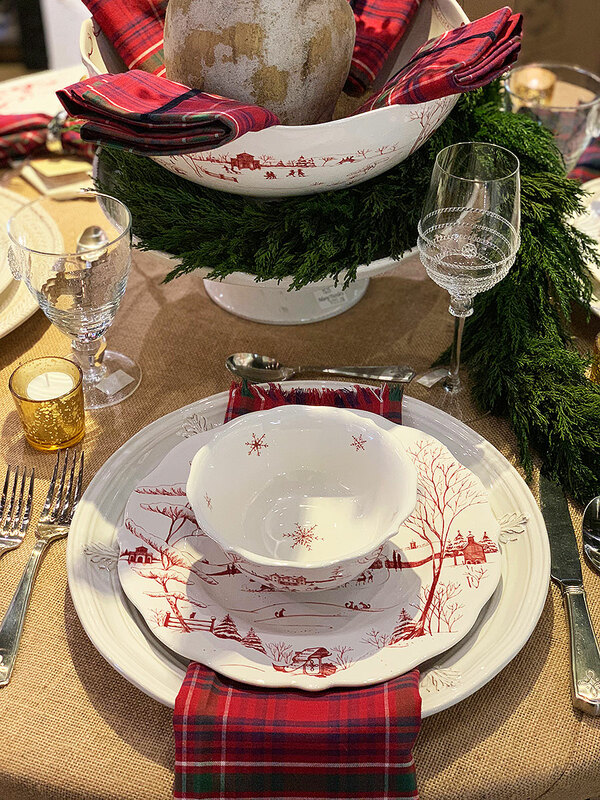 Even the wine glasses were different which added a casual feel to the table which still looked festive and holiday themed. 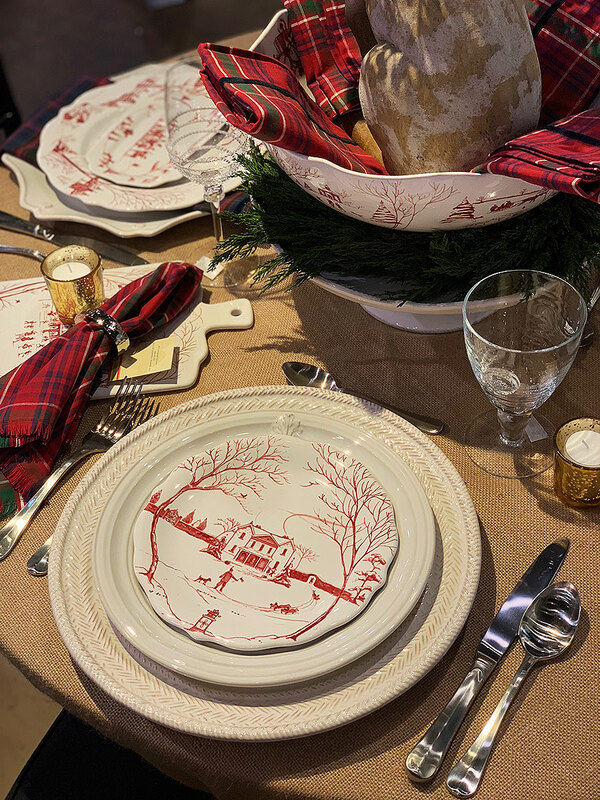 I love the new tartan napkins and beautiful napkin rings. And of course, a gold votive at every pacesetting is such a wonderful touch. So for your holidays this year, step out of the box a bit and bring out those bunnies to create something unique and unforgettable! Oh, and most importantly, if you live in St. Louis, stop by Mary Tuttle’s and get inspired with a lot more creative ideas. 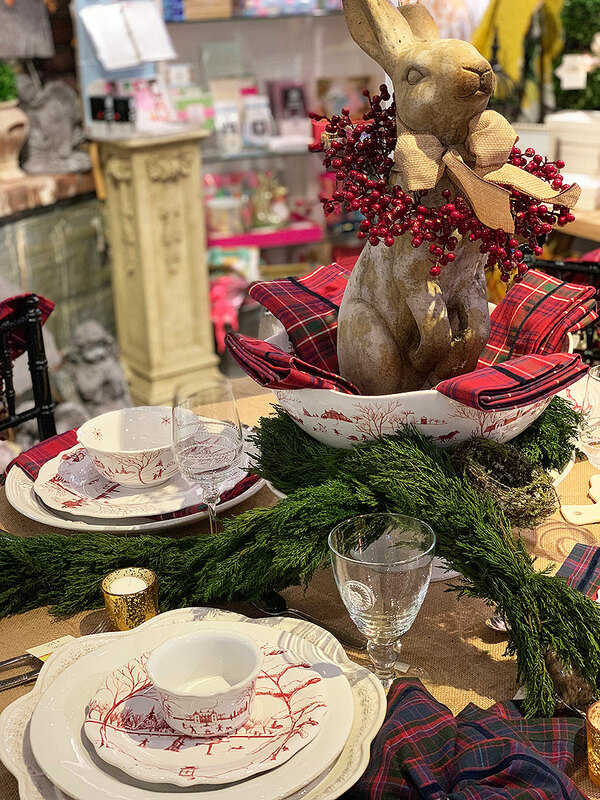 This entry was posted on Wednesday, November 14th, 2018 at 7:12 pm	and is filed under Christmas, Interior Design, Parties, Retail Displays, Table Decore.